Barnet boss Martin Allen believed his side fully deserved their 2-1 victory over Luton Town on Monday, declaring they were the ‘dominant’ team during the match. With the Hatters cheered on by 1,823 fans, swelling the overall attendance to 4,008, Allen made the baffling claim that even the Town supporters would admit his side deserved to pocket the points. 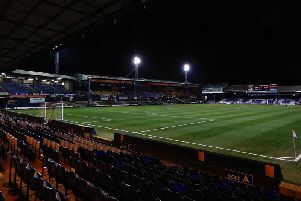 The Bees chief told the club’s official website: “Luton had fantastic support in the ground, and they backed their team right the way through the game. Barnet had dominated the opening period in terms of territory, utilising the hefty throw of Sam Muggleton as they went long to John Akinde and Michael Gash whenever possible. However, it was Luton who created the better chances and came into the game as far more of an attacking force during the second period with Barnet intent on running the clock down, twice denied by goal-line clearances as Allen continued: “I thought that we played very well in the first half. “As the game went on Luton were bound to come back into it – they’re chasing a play-off place. “We played a couple of days ago and they haven’t played for nine days, so at some point there was going to be a change in the way that the game was going. It had looked like Town would leave with at least a point after Cameron McGeehan scored with five minutes to go, and they could even haven pinched the victory themselves. However, Scott Cuthbert then handled inside his own area in stoppage time and Akinde, despite missing from the spot at Exeter on Good Friday, tucked home the penalty. Allen added: “Of course when they scored we could have panicked, but we went back on the attack.